Venerable Ajahn Chah Subhatto (Chao Khun Bodhinyanathera) (alternatively Achaan Chah, occasionally with honorific titles Luang Por and Phra) (18 June 1918, Thailand – 1992), was one of the greatest meditation masters of the twentieth century. Known for his informal and direct style, he was a major influence on Theravada Buddhism around the world. Venerable Ajahn Chah was an influential and perhaps the most famous monk of the Thai Forest tradition of Theravada. The monks of this tradition use various ascetic practices, known as dhutanga, on an occasional or regular basis to deepen their devotional practice. They might, for example, eat only one meal a day, sleep outside under a tree, or visit fearsome forests or graveyards. They also use meditation, for calming (samatha) and for insight (vipassana). Ajahn Chah established the monasteries of Wat Nong Pah Pong and Wat Pah Nanachat in Northeast Thailand, the grounds of which contain some of the last remaining forest land in Thailand. Wat Pah Pong now includes over 250 branches in Thailand, as well as over 15 associated monasteries and ten lay practice centers around the world. Ajahn Chah himself did not write much if anything for publication, but his talks were recorded, transcribed, translated and published as books and as free materials available on the Internet. Over a million people attended Ajahn Chah’s funeral in 1992, including the Thai royal family. He left behind a legacy of Dhamma talks, students, and monasteries. A Still Forest Pool: The Insight Meditation of Achaan Chah (Jack Kornfield ed.). Theosophical Publishing House (1985). ISBN 0835605973. Being Dharma: The Essence of the Buddha’s Teachings. Shambahla Press (2001). ISBN 1570628084. 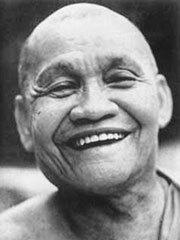 Food for the Heart (Ajahn Amaro, ed.). Boston: Wisdom Publications, 2002. ISBN 0861713230. Ajahn Sumedho, (Ed. Diana St Ruth — Illustrator Marcelle Hanselaar), Buddhist Publishing Group, 1990/2001. ISBN 0946672237.